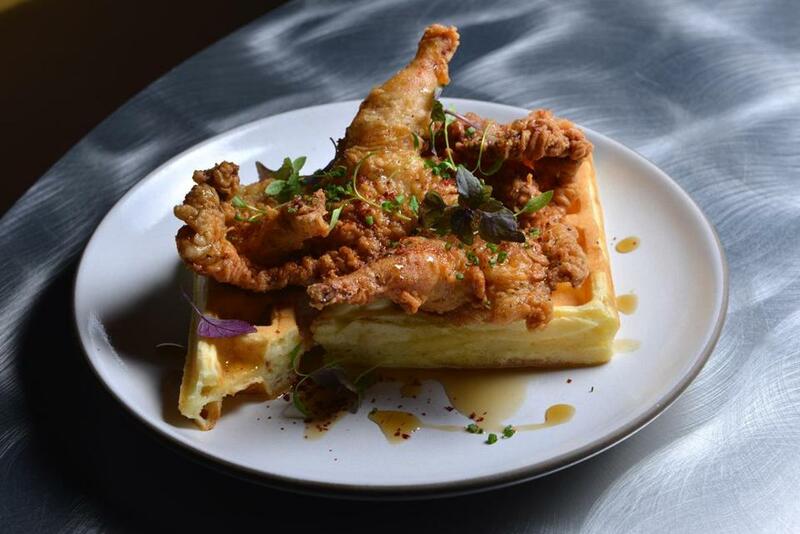 Fried Vermont quail with cheddar waffle, smoked butter and maple syrup that was featured at the now-closed Spoke in Davis Square. Closings: Two very sad adieus close out 2016. Davis Square’s swoony little wine bar Spoke (89 Holland St. at Simpson Avenue) shuttered on Dec. 22. Owner Felisha “Flea” Foster announced plans to close several months ago, writing on Facebook that she’d been dealing with very serious health issues. Foster was diagnosed with amyotrophic lateral sclerosis (ALS) last year, according to an earlier missive from the restaurant. “It is a testament to my incredible staff that they have managed to soldier on without me for so long,” she wrote when announcing the closure. The restaurant opened in April 2013 and was a prime neighborhood hangout thanks to an inventive, affordable wine list (Foster was once a wine buyer for Dave’s Fresh Pasta down the street) and tasty small plates from executive chef John daSilva. Meanwhile, Kendall Square mainstay Emma’s Pizza (40 Hampshire St. at Portland Street) announced a Dec. 30 closure. “This neighborhood has been so so good to us. Cambridge is solidly the foundation of Emma’s ‘personality’ and always will be,” owner-operator Jeffrey Weingast wrote (on Facebook, of course). Emma’s plans to continue to deliver to Cambridge but will focus on its “nifty” South End location (537A Columbus Ave. at Claremont Park). “Don’t be sad, we’re not even really going away!” promises Weingast. Openings: The 38-seat Cambridge branch of Saloniki (181 Massachusetts Ave. at Albany Street) officially opens on Jan. 2 within the Novartis building, says a rep for the fast-casual Greek restaurant. The Fenway original — helmed by Jody Adams, Jonathan Mendez, and Eric Papachristos — opened in March 2016. Enjoy seasonal soups, salads, and build-your-own sandwiches and pitas stuffed with savories like spicy lamb meatballs and zucchini-feta fritters. Saloniki Central Square also offers a student special: Present a student ID and get a free order of Greek fries with a sandwich or entrée. Reopenings: Back Bay Italian restaurant Piattini (226 Newbury St. at Fairfield Street) has officially reopened with a new look; it had closed in October after a fire. Sup on lamb chops, pasta, and martinis in a renovated dining room or on the enclosed patio.